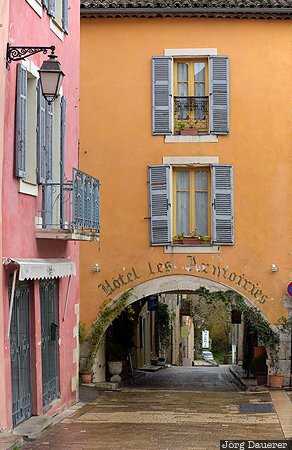 An arch over a narrow street in Valbonne below a house with a yellow facade and windows with gray shutters. Valbonne is in Provence-Alpes-Côte d'Azur in the south of France. This photo was taken in the afternoon of a cloudy day in March of 2015. This photo was taken with a digital camera.